On Saturday was the day I had been counting down for since I had qualified for it at the Merrist Wood 1 competition in January. The British Eventing JAS Final! I had Lily and Punch in the BE100, Lily in the Novice and Coco in the Open, so a busy day ahead! In 2013, with the support and sponsorship of Simple System Ltd., Ellie will be doing another FEI 2* ride and her first 3* ride, while Rigel will be doing the minimum number of rides possible to proceed up through the qualification system with a view to starting his FEI career in 2014. Meanwhile, I shall be giving Sofia the same education as Rigel had and taking her out to as many shows as possible so that, by the time her endurance career starts, she has experienced as much as possible. All the horses have enjoyed their holidays and are now well into their fittening work in preparation for the 2013 events. After a season off due to injury Caetano is back in action and feeling fantastic, fingers crossed we will make it to Badminton this year! I hope to continue Xavier and Doubtless Cuillin's intermediate education and move Ridgefield and Spring Prophet up to this level after a couple of novice runs to start the season. My two younger boys (rising six), Catherston Caractacus and Oakenhall True Star who had such promising starts to their eventing careers last year will start the season off at BE100 and then I hope to move them up to novice to further their education. 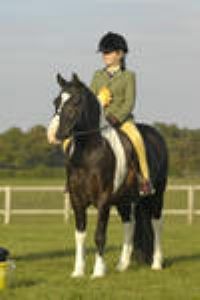 If all goes well I would like to take them to Osberton Young Horse Championships in the Autumn. With any luck we may have some new horse power coming to Gubby Eventing during this season to strengthen the string we already have.